Wind the wire onto the nail leaving 10-15cm free at each end. You may find it easier to tape the wire down so it doesn't escape. Strip the plastic covering off the end of the 2 ends of the wire. Try picking up paperclips with the nail. 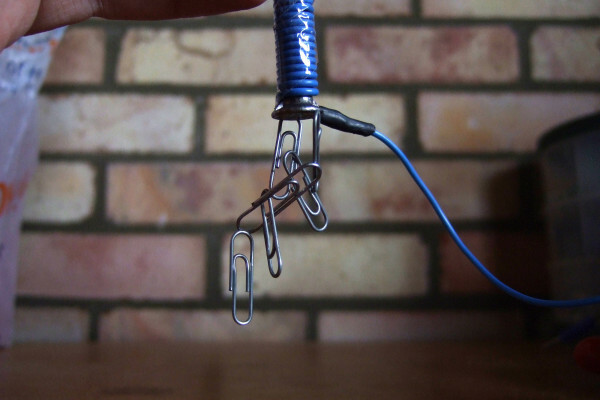 Hold the ends of the wire onto opposite ends of the battery, and move it near some paperclips. BE CAREFUL THE WIRE OR BATTERY MAY GET HOT - if it does, just disconnect the wire. Do not use a rechargeable battery as this can make the wire very hot. Disconnect the wire, what happens to the paperclips? You should find that if the wire is connected to the battery so there is an electric current running though it, the paperclips stick to the nail, but when you disconnect the battery most of them fall off. Although a couple may stay sticking on. Even if the wire is removed the nail will behave like a weak magnet. When you connect the battery to the wire a large electric current will flow through the wire. If an electric current passes though a wire it produces a magnetic field around it. The field is not very strong unless a huge current is put through the wire. But if you coil a wire around in a spiral, the magnetic field from all the parts of the wire add together to produce a much stronger field which looks like the field produced by a permanent magnet. This field is much stronger than from a single wire but still quite weak. Why do you use a nail? Iron is made up of tiny magnets which are normally randomly aligned. But if you apply a magnetic field, from your electromagnet, to them they line up with the electromagnet and add their magnetic field to the field from the electromagnet. Making the whole magnet stronger. This should allow you to pick up paper clips or possibly even a spoon. The iron is made up of lots of randomly arranged tiny magnets The electromagnet aligns the iron making the magnet stronger When the field is removed the small magnets in the iron do not all randomise. When the field is released some of the small magnets will be stuck pointing in the same direction, so the iron will still be magnetised. This is how you make a permanent magnet, although you normally use an alloy that you have to heat up to allow the tiny magnets to be able to move, this allows you to freeze in the magnetism and create a permanent magnet. Why can you pick up a paperclip with a magnet? A paperclip is made of steel (an alloy of iron) so it is also made up of lots of tiny magnets. These will line up when they get near your electromagnet so their south poles are near the north pole of the magnet and vice versa. so the paperclips are turned into a magnet and they are attracted to the original magnet and they stick. It also explains why you can form chains of paperclips. The first paperclip is turned into a magnet by your magnet, the paperclip magnet then turns the second paperclip into a magnet etc. etc. Each magnet is slightly weaker than the last so there is a limit to how long you can make the chain. This is also why Iron filings will stick to a magnet and form interesting spiky shapes following the magnetic field. Each tiny iron filing is turned into a magnet like the paperclips and they line up. Each line of iron filings will tend to repel other lines though because similar N and S poles will often be next to one another and so repel. What are the tiny magnets in Iron? On an atomic scale the magnetism is being produced from tiny electromagnets. The electrons in an atom can be thought of as orbiting the nucleus, if an electron orbits it is acting as a tiny electromagnet. Normally electrons pair up one orbiting one way and another the other, so their magnetic effects cancel out and the pair is not magnetic. But if there are any electrons left without a pair they can have a magnetic effect. This occurs in many atoms and they are known as being paramagnetic, and they are weakly attracted to magnets. However what we think of as magnetic materials, Iron, Nickel and Cobalt are far stronger magnets than these. These materials are known as ferromagnets in these the tiny atomic magnets naturally line up with the atom next to them, so you get regions or domains of atoms all magnetised in the same direction. Normally there are lots of these domains oriented in different directions. When you apply a magnetic field the domains aligned with the field grow and the ones against it shrink, so more of the atomic magnets are aligned with the field and the material will act as a magnet.